This week’s Sepia Saturday blog post topic is of the launch of HMAS Albatross, the Royal Australian Navy’s first seaplane carrier which was launched in February 1928 at Cockatoo Island Dockyard in Sydney. In family history—in history generally—we can never be sure what results will flow from our intentions. 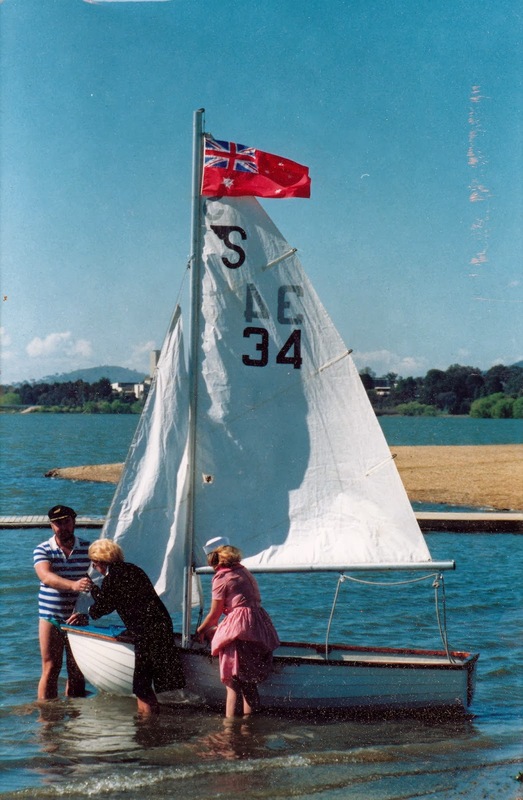 Here I am in 1987 with my mother Christa and my husband Greg launching our dinghy ‘Titania’ for its maiden voyage on Lake Burley Griffin in Canberra. But ‘launch’ has the same root as ‘lance’, a thrown spear does not always meet its target, and Titania did not always stay upright, as a good dinghy should. Some of our other boats—and projects—have floated better, but this often became apparent only in retrospect.